I’m gearing up for Crux Craft Fair, which starts this Friday, November 25 at Rattery Village Hall in Devon. If you’ve not been before, it’s a much more sumptuous event than you might imagine, given its location in a village hall. Fantastic ceramics, handmade prints, textiles, jewellery and more, plus a fantastic cafe with really great cakes. I’m gearing up for several sales I’m taking part in over the next few months, including Christmas exhibitions/sales at the Devon Guild of Craftsmen in Bovey Tracey and the Focus Gallery in Nottingham. 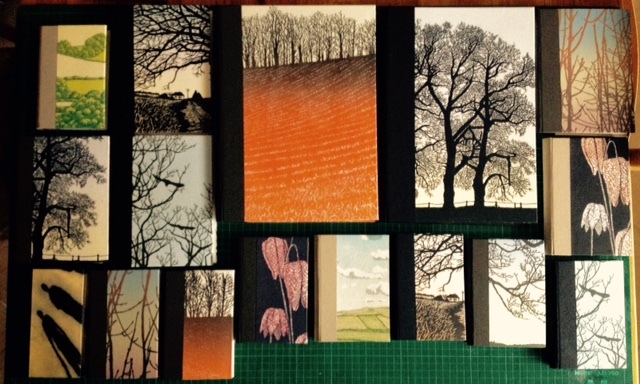 So I’ve been busy making books – the latest batch of which is shown in the photo. 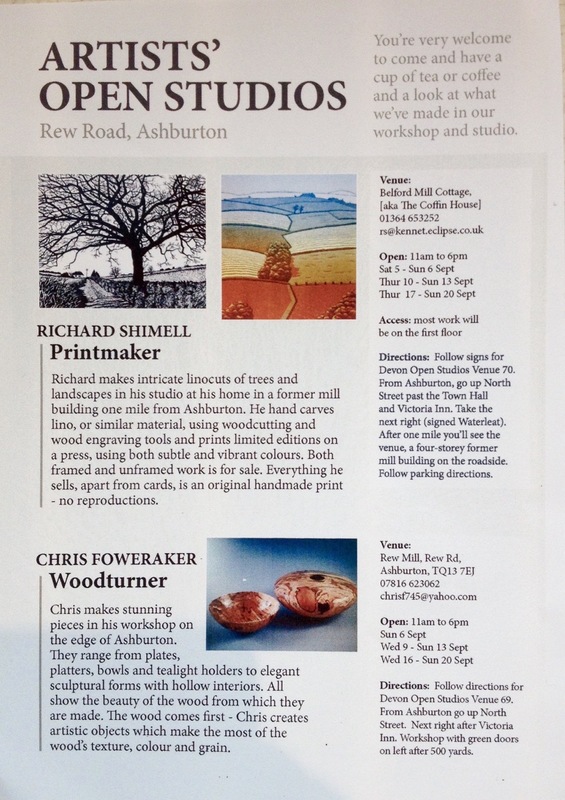 I’m looking forward to Devon Open Studios, when I will be welcoming visitors to my house and studio near Ashburton, Devon. I’m open 11am to 6pm Thursdays, Fridays and weekends from Saturday September 5 to Sunday September 20. It would be great to see anyone who fancies a visit. And when you’re bored of me, there’s also a fantastic wood turner – Chris Foweraker – just down the road. 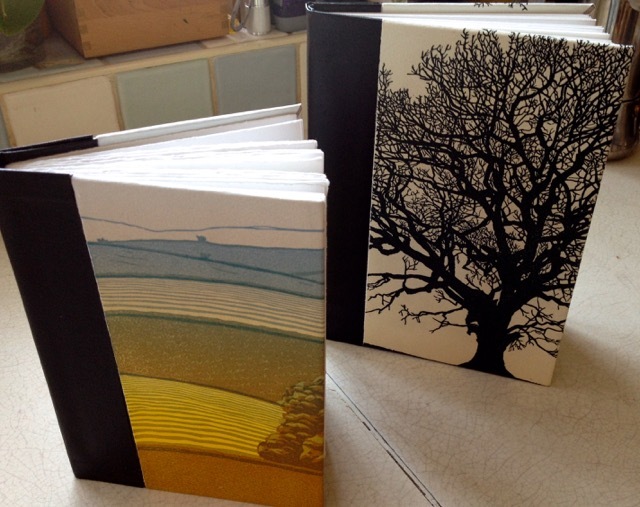 I’m joining the Dartington Bookbinders on their stand at Ways with Words at the Ship Studio, Dartington, every day from this Friday July 3rd until July 12th from 10am to 5pm. 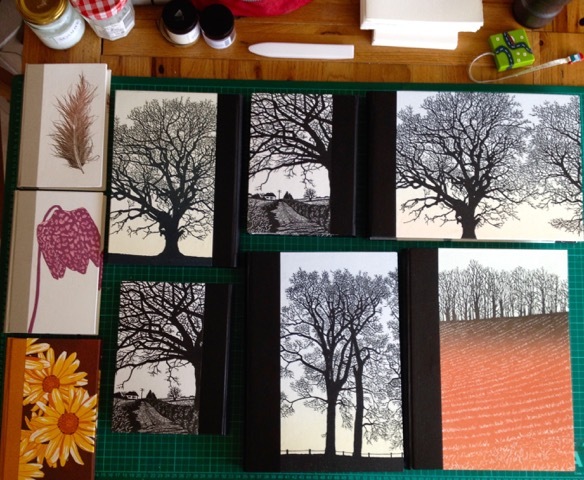 There will be about five of us, with handmade books and prints for sale. 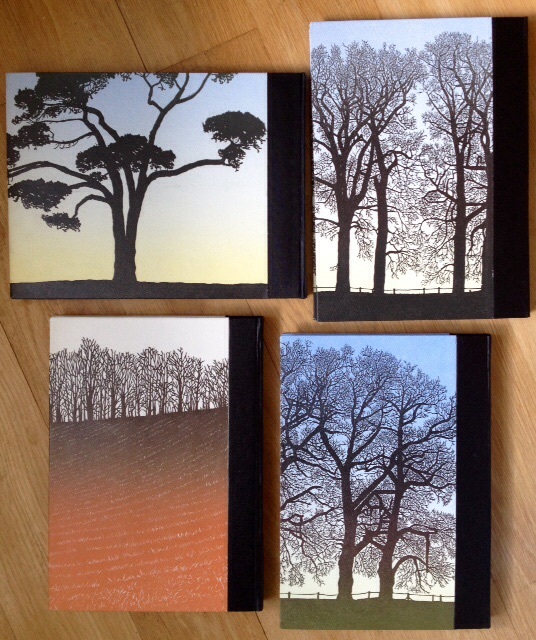 I’ve finally got around to finishing four large books – roughly A4 with 40 pages of 300gsm acid free cartridge paper. 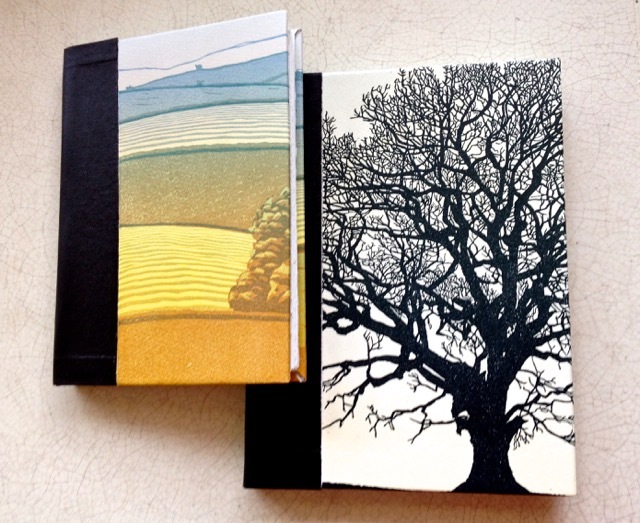 They’re intended as luxury journals, memento books or sketchbooks. I tore all the paper by hand to give as many nice torn edges as possible, grouped them into sections then sewed them on to book cloth. I made covers for the books from board with a book cloth and card spine and fitted prints to front and back, glued and folded the edges inside. 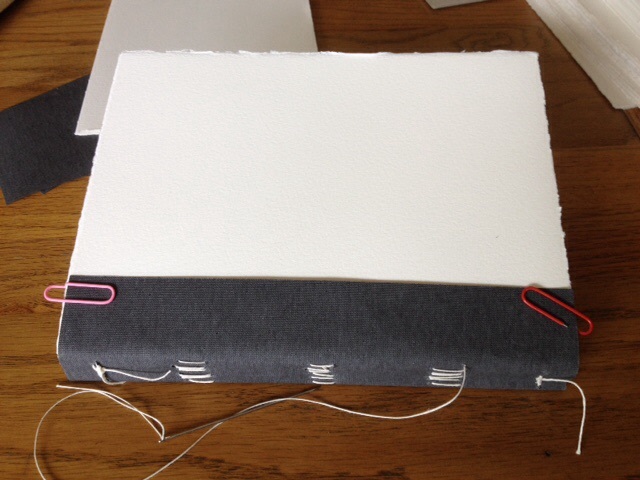 Then I stuck the sewn pages into the covers, laboriously filled in the spaces on the inside of the front and back covers with paper and fitted a clean piece on top to cover the workings. Then I put them in a press. First they went in one I made up myself. Then they went into a book press at the Darlington Bookbindery, where I’ve been learning from the wonderful Mary Bartlett. Finally, I had four books with prints on front and back. Now I have to put a price on them. 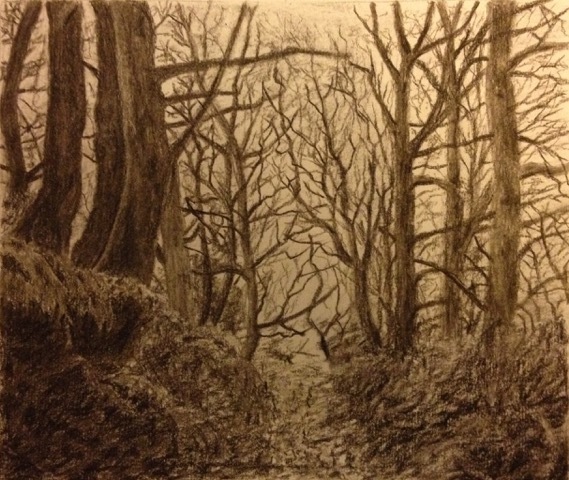 I did a drawing I was pleased with, because of the trees, textures and path. It was pencil, but when I took a photo of it in less than perfect light conditions, it turned sepia, which suited it, I thought. 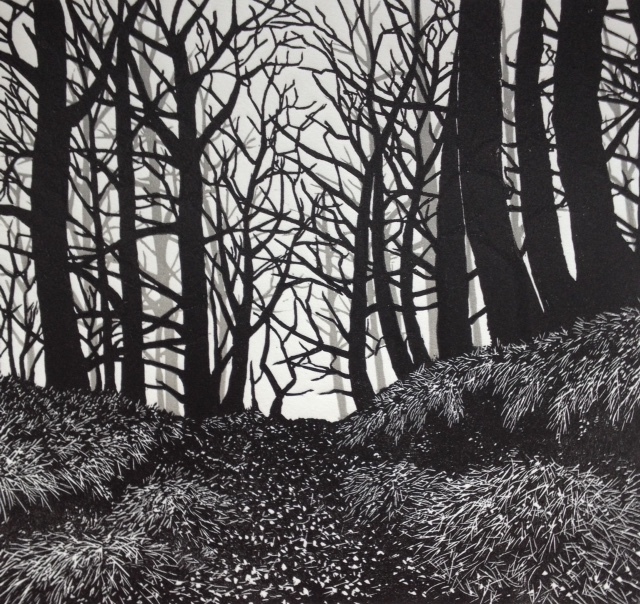 I’m now trying to turn it into a print, drawing it again, simplifying and changing it a bit, ready to be cut, possibly as another black and white print using both wood-cutting tools for removing the large areas of light and wood engraving tools to make patterned textures and greys/mid tones. I’m not experienced in doing this, so it’s exciting, but could be a disaster. 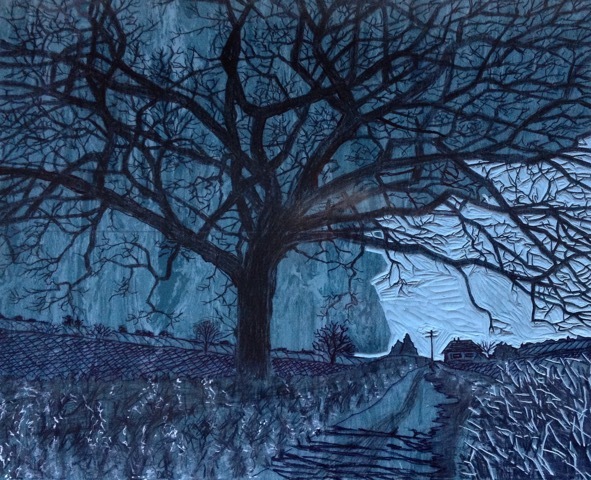 This is how the latest one turned out, after a long time removing the sky to show the trees with lino cutting tools and using the same plus wood-engraving tools on the foreground. 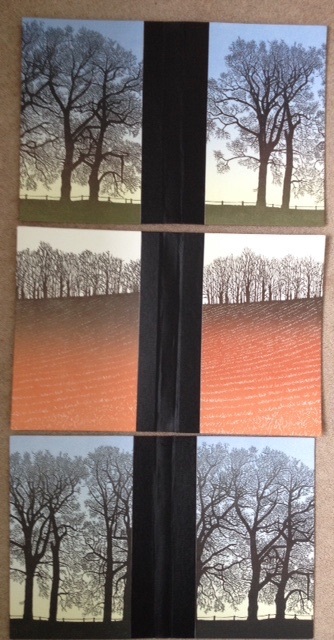 I was pleased with the print, but wondered how it would look if I made a second plate with more trees on it. I printed it first in a light grey, then printed the main trees on top. 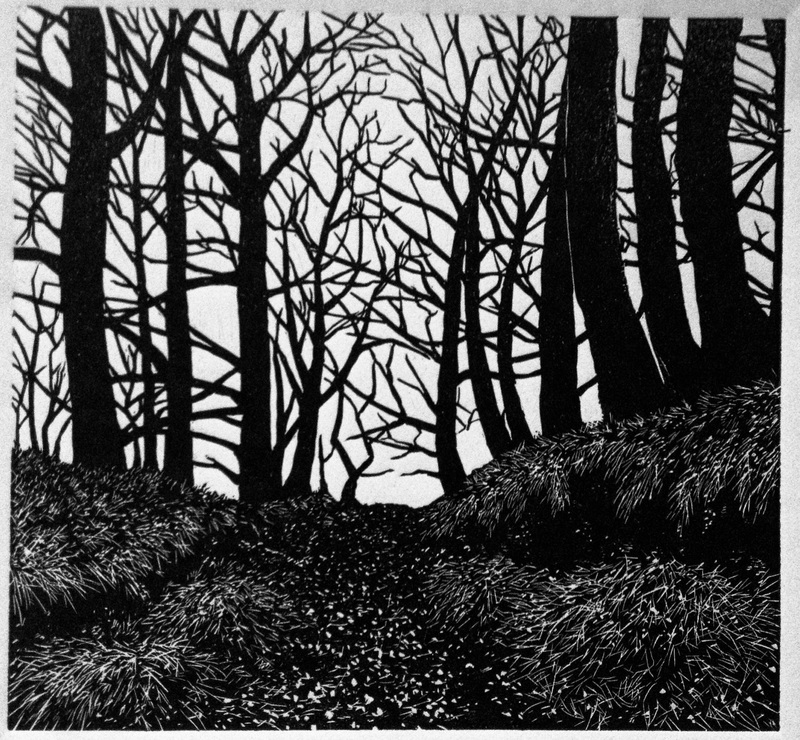 I spent a long time fiddling with the tones, and trying to stop the light grey trees showing through. Where they crossed the black trees there was a kind of ghost image, but I don’t think it matters – it looks a bit like shadows. I’ve improved the method. On the plus side the books hold together better and are stronger and neater. On the negative, they still take a long time to make, even when I do several of the same size at the same time. 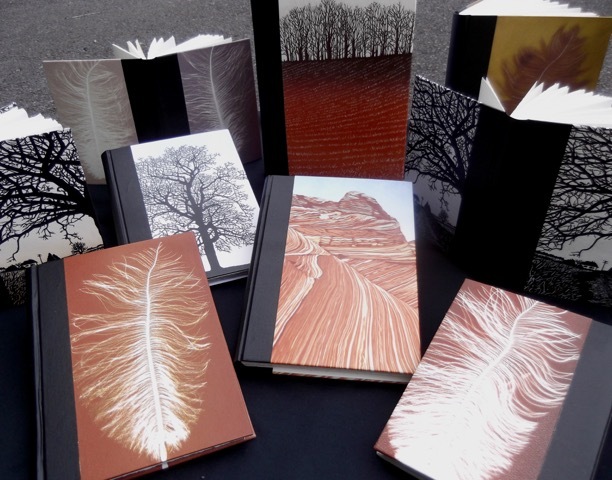 For each book Somerset paper is torn by hand into 15 pieces, which are then folded and smoothed flat with a bone folder. They are carefully sewn together on to an inner spine of bookcloth. Boards are cut for the covers with bookcloth cut to fit between and hold them together, then two prints are cut to fit front and back. A liquid wax-like coating is then brushed on to the print to protect it. There’s an amazing tree on a lane where I live in Devon. It arches over the road and fills the sky. I wanted to portray it, but not on its own as I usually do, so I’ve put it in its landscape. I drew straight on to the plate, which is a piece of smooth vinyl flooring, using soft pencils and a little white pen for highlights. The image below is in black and white – the plate is actually blue, as you’ll see if you scroll down. 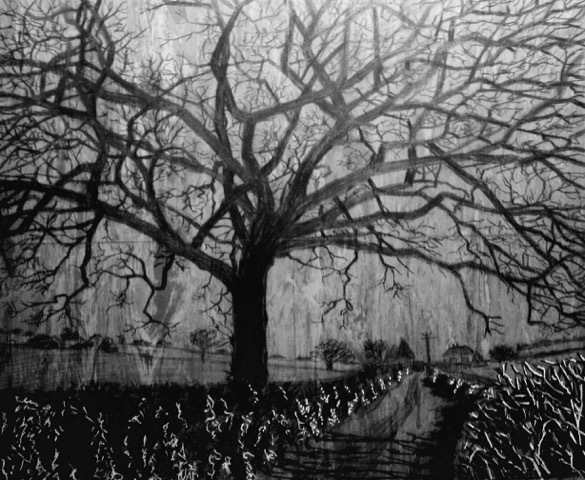 I thought I’d cut the tree out as a silhouette, then if the rest of it went wrong, I could perhaps trim the plate and save the tree to print on its own. 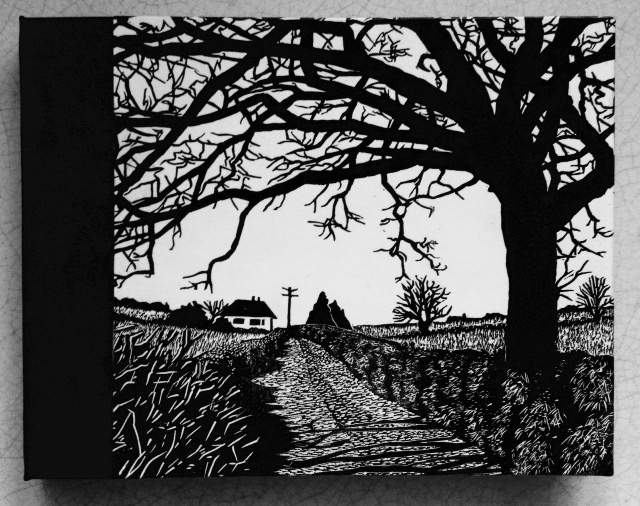 I also thought I’d try using some wood engraving tools alongside the usual wood-cutting ones, so I could add texture and some greys on the fields and hedge, so it would work as a black and white print, but I might also add colour somehow at a later stage. Anyway, the cutting has taken a week – pretty quick for me. 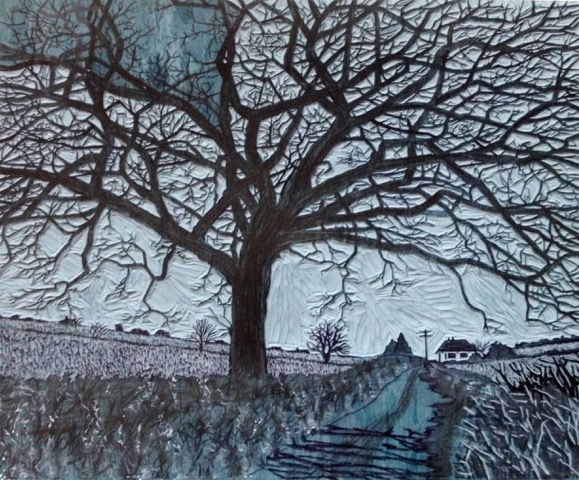 I wasn’t convinced the fine texture on the fields created with the wood engraving tool, would actually print, as it could hold too much ink and just turn out blobby. 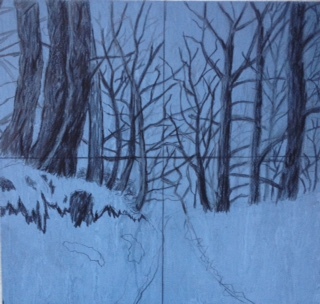 The pic above doesn’t show the final version, as I also cut texture into the road and the hedge. Still more fiddling to do, e.g. 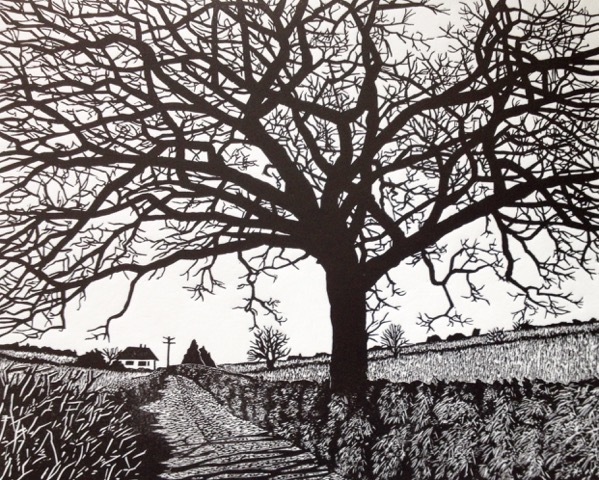 on tree and a bit on the hedge and fields, but I’m pleased, as it’s exciting to have some success with the wood engraving tools adding texture and greys. 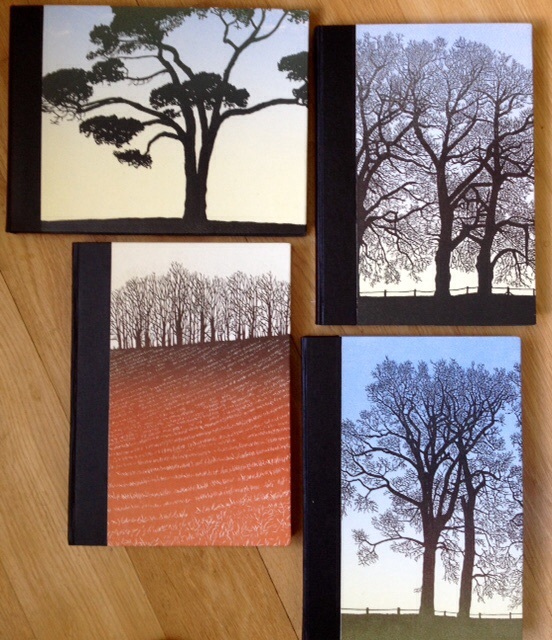 I’ve recently learned how to make handmade sketchbooks/journals and have been practising. 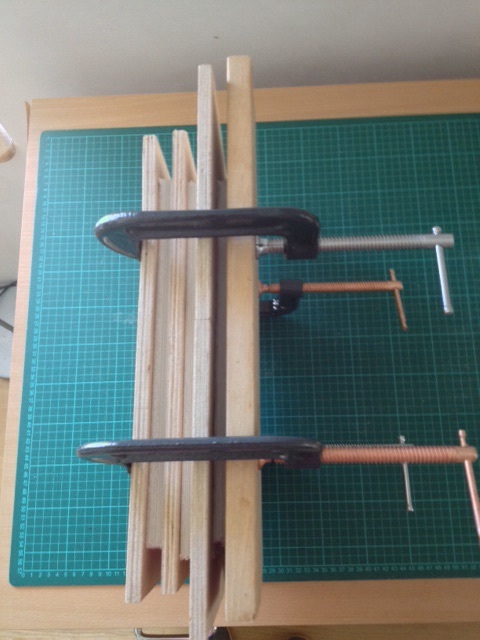 It’s quite straightforward, but fiddly and time-consuming cutting the paper, sewing it all together, then cutting bookcloth to cover the spine, but rewarding to make something. I think they look good with a print on the cover and back from my drawer of proofs. Now I need to see if anyone wants to buy one.